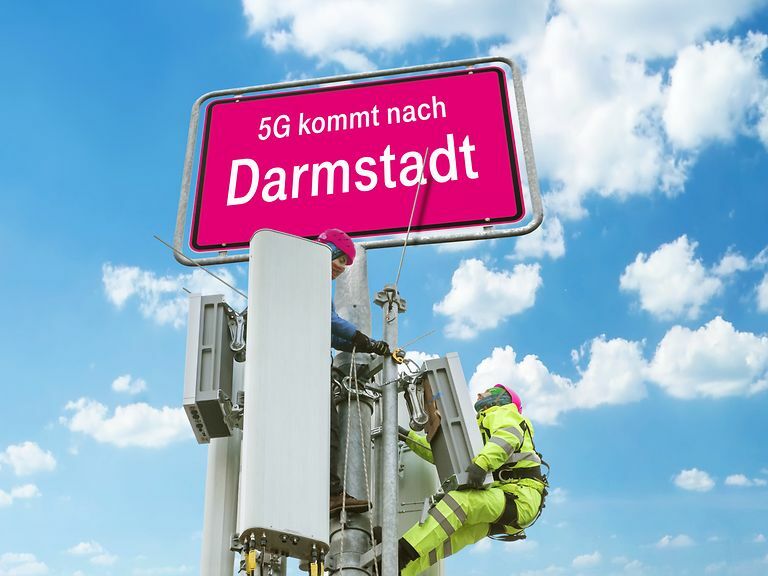 Darmstadt has joined the ranks of Deutsche Telekom’s 5G cities. A first group of 5Gantennas is now in operation in that city. The new systems follow 5G-antenna test fields in Berlin and the Port of Hamburg. The aims in connection with the Darmstadt 5G test field include gathering experience with installation and operation of systems for the new technology. In addition, a range of 5G applications and devices will be tested. For the project, Deutsche Telekom is cooperating closely with the City of Darmstadt and with Ericsson, its technology partner. Plans call for Darmstadts’s 5G test network to comprise a total of 18 antennas, at a total of six different sites, and to be fully in place this spring. The first antennas for the test field are now in operation at a site along the city’s Mina-Rees-Straße (Mina-Rees Road). The test field array will conform to the 5G New Radio (5G NR) standard, the radio air interface standard for the future 5G mobile communications component. The antennas will operate on the basis of a test license for field tests in the 3.7-GHz spectrum. Commercial systems provided by Ericsson will be used. The test field antennas employ the state-of-the-art antenna technology that is central to 5GNR: Massive MIMO (Multiple Input, Multiple Output), a technology that greatly increases the number of transmitting and receiving antennas in place. With its large number of elements per 5G antenna – up to 64 – Massive MIMO enables high data-rate, highly reliable links, and thus greatly improves performance for individual users. In addition, Massive MIMO networks use beamforming technology, which greatly enhances the efficiency with which the available spectrum is used, thereby making performance much more consistent throughout the network. To help accelerate the development of new 5G applications, Deutsche Telekom, working in cooperation with hubraum, its Berlin-based start-up incubator, has launched a 5Gprototyping program. The start-ups at hubraum are now using Deutsche Telekom’s 5Gtest field in Berlin to develop 5G applications under live conditions. The 5G cluster in Berlin, which has been in operation since May 2018, now comprises more than 50 antennas. Since the end of January, hubraum’s Prototyping 5G program has been filled to capacity, with a total of 15 participating start-ups, including participants from Germany, Denmark, France, Poland, the Netherlands, England, Israel and Finland. The focuses for the new applications under development include the areas of virtual reality / augmented reality, virtual gaming, entertainment, robotics and future mobility. All of the new concepts involved require high bandwidth and extremely low latencies – and thus cannot be implemented without 5G. The start-ups in hubraum’s 5G program have the unique opportunity to use Deutsche Telekom’s 5G network in the heart of Berlin, on a pioneering basis, to see whether their ideas can work in a live environment. And with MobiledgeX edge software, available within Telekom Deutschland’s cloudinfrastructure since November 2018, the start-ups also have the opportunity to test their 5G concepts and prototypes in an edge computing environment.